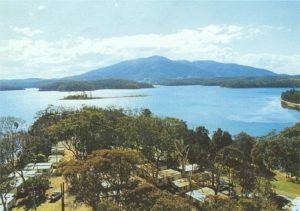 Regatta Point Holiday Park has some of the most picturesque caravanning and camping sites you could imagine. To check the location of sites, just click on the map link above. The majority of sites are located right on the waters edge creating a welcome retreat for all. Gas BBQ’s and picnic tables are scattered throughout the park encouraging. Fire drums add atmosphere that revive memories of long ago holidays. Lots of things to keep the kids occupied. There is a large adventure playground located at the end of the sites towards the boat ramp and jetty. Little nooks and crannies around the point provide just the place to explore and create magical mind stories and everlasting memories. Bike riding is allowed just so long as they wear a helmet. There is many a fish caught from the jetty and in prawning season you can get a feed of beautiful prawns right on your doorstep.